One of our Central NY clients was ready for her very own "Big Girl Ring". 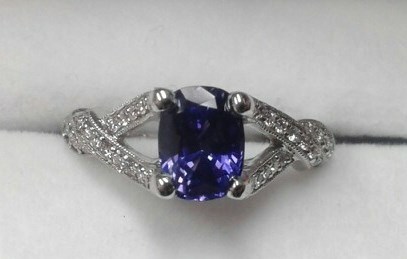 We helped her choose a spectacular mounting, and set a genuine Color Changing Sapphire in the center. The Sapphire changes from bright cornflower blue to a beautiful purple in different lighting. The color change is all natural, and truly joyful to watch. Stop in to Diana Jewelers of Liverpool today and see what we can create for you!